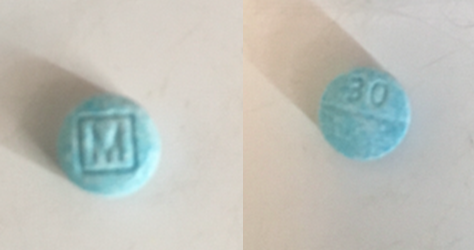 JAMESTOWN, N.D. – Jamestown Police is warning about small, blue Fentanyl pills they’ve found made to resemble Oxycodone. The pills are stamped with an M on one side and 30 on the other that are being sold on the streets. Fentanyl is up to one hundred times stronger than morphine. If anyone comes in contact with pills matching these, please contact police.